06:30 - 07:00 - Pick up from various hotels in Bangkok. Please be ready and waiting in the lobby of your hotel before the pick up time (depending upon the hotel location), transfer to the River Shopping Complex. 07:30 - 09:00 - Arrive at River Shopping Complex and depart to Ayutthaya by Air-Conditioned Coach, passing through many main parts of the Angel City. Along the way, you will see an agricultural country. 09:00 - 10:30 - Arrive at the Bang Pa-In Summer Palace, built during the Ayuthaya era. The palace is beautifully decorated in both traditional Chinese and European style. See the beautiful Aisawanthipaya- Art Pavillion, the unique Chinese-style hall with a vast collection of Thai, Chinese, and European artifacts, as well as many other outstanding monuments. The palace itself is a pretty garden with plenty of rare flowers. 10:30 - 11:30 - Arrive at Ayutthaya, a World Heritage City and historic capital of Thailand. 11:00 - 12:30 - Visit Wat Maha That. Over 600 years old, Wat Maha That was the heart and soul of the Ayuthaya people. It was almost completely destroyed by the Burmese during Thai-Burmese war. 12:30 - 15:00 - Welcome aboard the Grand Pearl Cruise Liner at Wat Chong-lom Pier (Nonthaburi). Sumptuous Thai buffet lunch with a choice of a variety of oriental and western cuisines, while you may relax and enjoy the fascinating scenery on the River of Kings. The boat will pass Nonthaburi province before reaching Bangkok City. 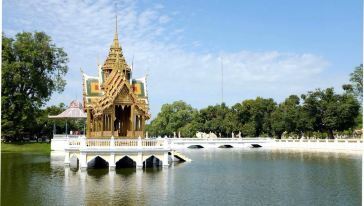 15:00 - 16:00 - Coffee will be served while you enjoy the enchanting sights along the River banks such as the colorful Royal Barges, Thammasart University, The Royal Grand Palace and the graceful Wat Arun - the Temple Of Dawn. 16:00 - 17:00 - Arrive Bangkok and disembark at the RIVER CITY SHOPPING COMPLEX, and transfer you back to your hotel. 06:30 - 07:30 - Pick up from various hotels in Bangkok. Please be ready and waiting in the lobby of your hotel before the pick up time (depending upon the hotel location). 07:30 - 08:00 - Arrive at Check-point. 08:00 - 08:30 - Departure to Ayutthaya by by Air-Conditioned Coach, passing through many main parts of the Angel City. Along the way, you will see an agricultural country. 08:30 - 10:00 - Arrive at the Bang Pa-In Summer Palace, built during the Ayuthaya era. The palace is beautifully decorated in both traditional Chinese and European style. See the beautiful Aisawanthipaya- Art Pavillion, the unique Chinese-style hall with a vast collection of Thai, Chinese, and European artifacts, as well as many other outstanding monuments. The palace itself is a pretty garden with plenty of rare flowers. 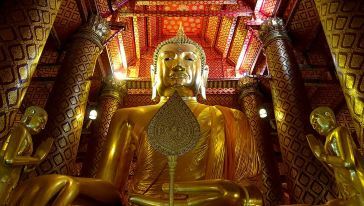 10:00 - 12:30 - Visit Wat Phanancherng, contains the oldest large cast bronze Buddha image in Ayutthaya and Wat Maha That Over 600 years old, Wat Maha That was the heart and soul of the Ayuthaya people. It was almost completely destroyed by the Burmese during Thai-Burmese war. 12:30 - 13:30 - Enjoy Thai Buffet Lunch. 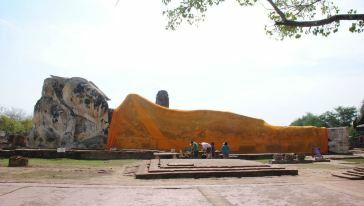 13:30 - 14:30 - Continue to the Ayutthaya Historical Park and visit to the ancient palace ground. Wat Phra Sri Sanphet, once a royal temple lying besides the Grand Palace, was once the most significant temple during Ayutthaya period. 14:30 - 16:00 - Depart from Ayutthaya back to Bangkok. 16:00 - 17:00 - Arrive at the restaurant for short break and visit the jewelry shop (if you do not need shopping, please tell tour guide on the way back to Bangkok,they will arrange the transfer back to the hotel). 17:00 - Arrive at Bangkok and start to transfer tour participants back to hotels. Ayutthaya (อยุธยา), full name Phra Nakhon Si Ayutthaya (พระนครศรีอยุธยา), is an ancient capital and modern city in the Central Plains of Thailand, 85 km north of Bangkok. It is the Capital City of the Province of this name. 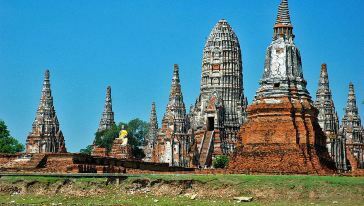 Founded around 1350, Ayutthaya became the second capital of Siam after Sukhothai. 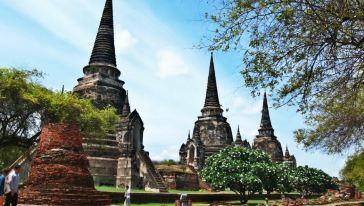 Throughout the centuries, the ideal location between China, India and the Malay Archipelago made Ayutthaya the trading capital of Asia and even the world. By 1700 Ayutthaya had become the largest city in the world with a total of 1 million inhabitants. Many international merchants set sail for Ayutthaya, from diverse regions as the Arab world, China, India, Japan, Portugal, the Netherlands and France. Merchants from Europe proclaimed Ayutthaya as the finest city they had ever seen. Dutch and French maps of the city show grandeur with gold-laden palaces, large ceremonies and a huge float of trading vessels from all over the world. All this came to a quick end when the Burmese invaded Ayutthaya in 1767 and almost completely burnt the city down to the ground. Today, only a few remains might give a glimpse of the impressive city they must have seen. Its remains are characterized by the prang (reliquary towers) and big monasteries. Most of the remains are temples and palaces, as those were the only buildings made of stone at that time. 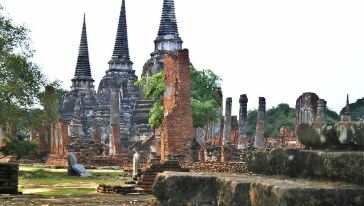 The great cultural value of Ayutthaya’s ruins were officially recognized in 1991, when the Historic City became an UNESCO World Heritage Site. Bang Pa-In Summer Palace, was first used by the royal court as a summer retreat in the 17th century. However, the Palace was destroyed with the fall of Kingdom of Ayutthaya and was restored by King Rama IV in the mid-19th century. Most of the buildings that exist today date from the reign of King Rama V, who regularly spent his summers there. The structures represent a variety of architectural styles, set in a large park around ponds and waterways. The only royal residence open to the public is the Chiness-style Wehat Chamroon Palace, constructed entirely of materials imported from China. 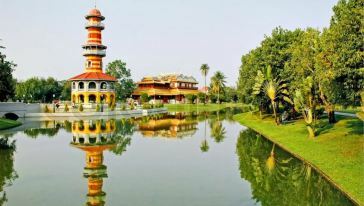 In addition, there is an Italian-style palace, a circular pavilion with steps leading down to a pool, the graceful Thai-style Aisawan Tippaya Asna Pavilion in the middle of a lake, and, across one of the waterways, a Buddhist chapel in the neo-Gothic style with stained-glass windows. Scattered around the extensive gardens are European statues as well as monuments ordered to be built by King Rama V in memory of members of his family, one of them a much-loved Queen who drowned in a boating accident. Wat Mahathat (Temple of the Great Relics) is located almost right in the center of Ayutthaya. Apart from being the symbolic center where the Buddha’s relics were enshrined, Wat Mahathat was also the residence of the Supreme Patriarch or leader of the Thai Buddhist monks. 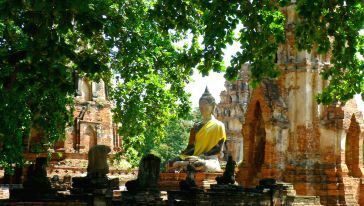 The temple is believed to be built during the 14th century A.D. (the early Ayutthaya period). However, it can easily be judged from the size of the base, that the prang was quite high. As in most architecture of the early period of Ayutthaya, the main prang was the most important edifice in the temple compound. 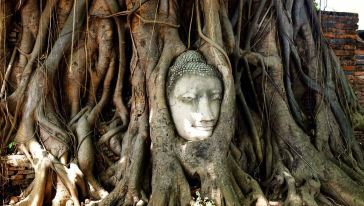 For tourists, Wat Mahathat offers the much photographed Buddha head, embedded into a tree trunk. This important and most impressive monastery is located in the Grand Palace compound like Wat Phra Si Rattanasatsadaram (Wat Phra Kaeo) of Bangkok. Used as a residential palace, it became a monastery in the reign of King Ramathibodi I. When King Borom Trai Lokanat commanded new living quarters built, this residential palace was given to be a temple area, thus originating Wat Phra Si Sanphet: The royal chapel does not have any monks and novice inhabitants. Wat Phra Chao Phananchoeng is located southeast of Ayutthaya island at the confluence of the Pasak River and the Chao Phraya River. According to historical records a first temple was built at the site in 1324 A.D. (before the founding of Ayutthaya). An impressively large Buddha Image, Phra Chao Phananchoeng, is houses in a specially dedicated tall building. It is constructed of brick and mortar. Its precise date of construction is not known. It is reported to have been repaired at the time of King Naresuan the Great. It was also repaired and renovated by the Kings of the Chakri Dynasty. Wat Phanan Choeng is a busy wat, with many Thai people worshipping there. They reportedly offer worship to the image and obtain predictions of their luck. You will also notice a lot of Chinese characters and writing before entering the main building. Chinese people name the image ’Sum Poh Kong’, which means ’Good Luck in Boating’. The Buddha Image itself measures 14.25 meters from knee to knee, and 19 meters in height (including the ornament above the head). Is has the posture of Subduing Mara (as so many Buddha Images in Thailand). While it is constructed of bricks and mortar, the Buddha Image now is completely gilded. This temple is different from most other temples you may visit in Ayutthaya, since it is a ’living’ one. 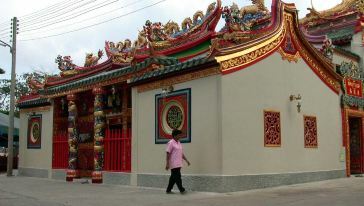 Many Thais (and Chinese) worship here. At the time we visited a ceremony was taken place, where the robes of the Buddha Image were being changed.